Why Do Degus Take Dust Baths? Pet degus not only need to take dust baths to keep their coats in top condition but they also love rolling around in it just for fun. The special dust they roll in helps keep their fur from getting too oily and keeps it healthy while also giving enrichment to your degu. Dust bathing is a natural thing that all wild degus do and all degu pet owners should offer dust baths to their degus regularly. 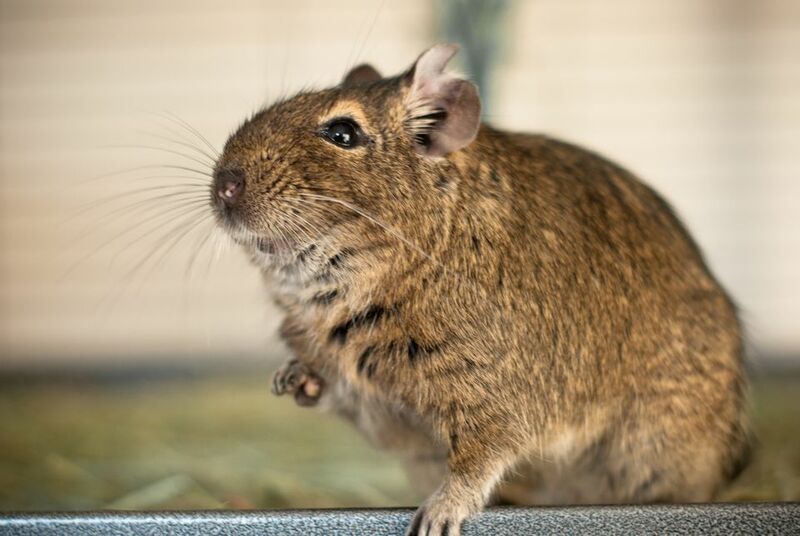 Degus use the same kind of dust as pet chinchillas. This dust can be purchased from almost any pet shop and substitutions should not be made (garden or play sand will not work). Degu and chinchilla dust is finely ground pumice, a volcanic rock that is found in South America where the rodents are native to. This dust, or ground rock, has a sparkle to it and is just as the name states - a dust. Several brands exist but chinchilla owners seem to prefer the Blue Sparkle and Blue Cloud chinchilla dust brands over some of the other varieties. The dust can be used over and over again until your degu decides to use it as a toilet. Once the dust is soiled (urine or feces) you should throw it away, wash out the dust bath container, and use new dust. About an inch or so of the dust at the bottom of the container is all that is needed for your degu to roll around in. Getting your degu to take a dust bath won't take much effort on your part. Degus love to take dust baths and will readily jump in whatever container you choose to put their special, sparkly, dust in and start rolling around. Special dust bathhouses are sold in pet shops but any container with sides on it will do. If you are worried about the mess the dust will make be sure to put the dust in a tall plastic food storage container, place it on its side and take off the lid. This will help contain the majority of the dust. Otherwise, a simple, sturdy bowl (such as a ceramic bowl) is all that is needed to keep your degu dusted. How Often Should You Give Your Degu a Dust Bath? Degus will gladly roll around in their dust daily but that will get messy and expensive. A bath a few times a week is plenty to keep your degu's coat clean and not too greasy. Giving a bath too often can cause your degu's skin to dry out and make him itchy. If you see your degu itching and scratching on a regular basis try offering shorter dust baths (less than 5 minutes of dust time) or less frequent dust baths (once a week). Do Degus Take Regular Water Baths? No. Degus do not like water and should not be given water baths. Water can cause your degu to get a chill while he is wet and catch a cold. Since degus are from warm environments they are very sensitive to temperature changes and don't do well if they get cold. Also, degus will be very angry with you if you try to put them in a water bath so it is best avoided! Watching a degu take a dust bath is not only fun because of the flipping and rolling they do in the dust but it is also fun to see such a natural reaction to the dust. Very few creatures roll around in dust to stay clean and only chinchillas and degus do it in this manner.